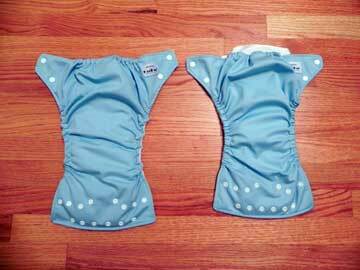 When I started this whole cloth diaper switch I wanted to find something simple, easy to use, I could leave with my babysitter, husband, and that I could change with my eyes half closed in the middle of the night if needed. Being new to this whole world I started with a trial. Cutie Poops and Bottoms diaper trial includes a FuzziBunz perfect size diaper and a one-size diaper. I LOVED the perfect size diaper. I love that lil’ man feels totally dry when I change him. I love that it was probably one of the softest diapers I had to try, and it really doesn’t leak, unless I let him go too long (2.5 hours) or I double stuff. It holds everything in the’ number 2’ area quite well. No explosions! YEA! It is easy to wash, earth friendly and by far one of the trimest diapers we have tried if it isn’t double stuffed (read his pants still fit). I don’t mind that I have to shake out the wet insert to wash, and with a poop liner, there is little to rinse off. Great! I also like that they snap so the “diaper wars” aren’t terrible! My son can’t try to pull it off like he tires to with Velcro. They also come in tons of cute colors, and it looks like, perhaps, in the past patterns? (which I certainly hope they bring back). Photo below: Small perfect size on 12 lb 3 month old baby. We haven’t had many stink problems (just once) but I use EcoSprout (2 table spoons in a top loader with about 10 diapers in the load and it set to medium for water level). I do a prewash and 15 minute soak in cold. Then I add the detergent; do a HOT wash followed by a cool down rinse, and then an additional cold rinse. I then dry the inserts in the dryer and line-dry the pockets. If it’s nice out, I dry them outside which is great for naturally bleaching any breast milk stains and really leaving them fresh smelling. To do pockets you need to have quite a few. I currently use 9 FuzziBunz and a few other diapers and wash every other day to every 2 days. They dry quickly so even with working full time, it’s still totally a doable cloth option. Laundry only takes me 35 minutes to wash a load and 50 minutes to dry a load completely. As for the sizing, I think the mediums have a very high-rise and are a bit bulky on my skinny son, but as he grows I’m sure they will fit better. I hope I won’t have to buy any more than the mediums, so the length is actually a good thing. The leg area comes down a bit far on him in the Mediums but I think that will get better as he grows since the smalls don’t seem to have this problem. He seems to be right between sizes. Overall size wise I like FuzziBunz perfect size, and think they fit much better than the one size. The one-size was nice because I could adjust the back elastic, but other than that, they were just more bulk for my lil’ man. I have only a few complaints. FuzziBunz will leak if they are too full. My son likes to be changed, rather he looooves to be changed so I change him frequently. On the rare occasion that I need to leave him in it a bit longer or he drinks a lot at one feeding, he most likely will pee through the diaper. It surprises me because he won’t leak through the legs, but up his back, usually on a side. I don’t use these are night because I just don’t like having him in something so bulky, but that’s just me. I recently purchased some hemp inserts to use when I double stuff so we’ll see if that helps and I can begin to use these at night. Most people seem to think they are great for night. It could just be my son is long and thin. It is a bit pricey compared to other diapers that are very similar and Charlie Banana’s work just as well. CB’s offer more options in terms of adding a disposable if needed. The CB’s are less expensive, and I was able to use a Babies R’ Us gift card to buy them. For the fit and for starting out, FuzziBunz are great diaper. 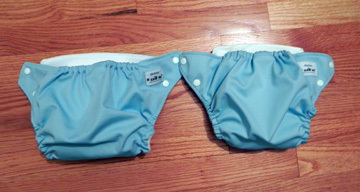 They definitely make a great first impression for cloth diapering. My lone MAJOR complaint about FuzziBunz is regarding the “new” diapers. They moved their factory from China to Turkey which was supposed to give them better quality, etc, etc. I personally feel like it did a little of the opposite. 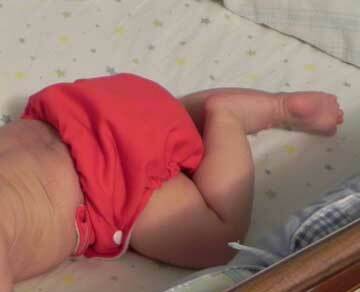 The fleece isn’t as ‘soft’ and doesn’t seem to wick as quickly as the diapers made in China. It seems like it is more ‘raggy(? )’ than the previous fleece and the poo attached to it a tad. The leg gussets are also loose compared to the older diapers, as well as the back elastic, and I find with the new diapers I get more leaks. Since I have some of both, I tend to look at the fleece before I put them on and if the newer ones are in my stash I might grab something else. 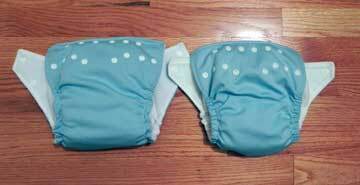 Below are photos of two medium perfect size diapers purchased on the same day. 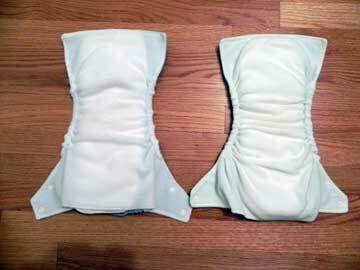 The one on the left is the “New” diaper and the one on the right is the “Old” diaper. I prefer the “Old” one on the right and think it is generally just made better. I still like them enough to keep using them, and I’ll give them some time to get a bit more worn in. Their Customer service on Twitter is also nice, it gives you a quick response if you need/have a problem with anything. Final Say: Buy it, give it a try, it’s worth seeing if it works for you, since we own 9 we still use them all the time. I’m just really disappointed in the new fleece.